1) Finnie, J. W. 2003. 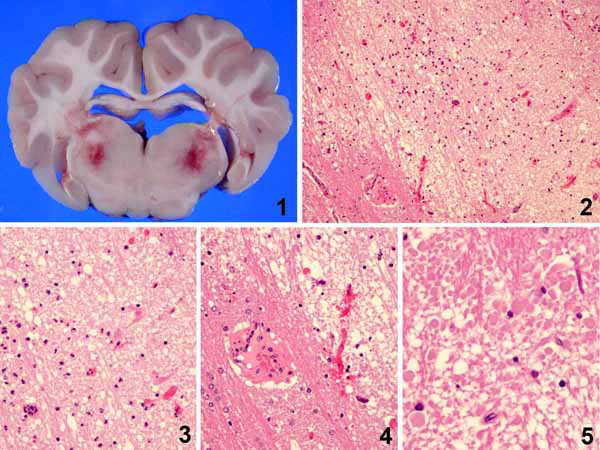 Pathogenesis of brain damage produced in sheep by Clostridium perfringens type D epsilon toxin: a review. Aust. Vet. J., 81: 219-221. 2) Summers, B. A., Cummings, J. F., de Lahunta, A. 1995. Focal symmetrical encephalomalacia. pp. 269-270. In: Veterinary Neuropathology, Mosby-Year Book, St. Louis. 3) Uzal, F. A. and Songer, J. G. 2008. Diagnosis of Clostridium perfringens intestinal infections in sheep and goats. J. Vet. Diagn. Invest., 20: 253-265.